ROSEVILLE, Calif. (April 5, 2019) – Stock car racing returns to Roseville on Saturday night April 13, with SPEARS SRL Southwest Tour and NASCAR Whelen All-American Series. 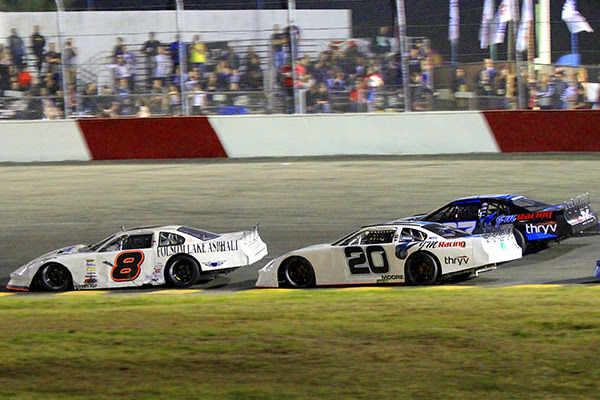 The “JM Environmental 127 presented by 51FIFTY LTM” will bring more than 20 of the best Super Late Model competitors in the nation to the All American Speedway to kick off a busy 2019 campaign. Twin 35-lap races for the NASCAR Late Models are also on tap, along with NASCAR competition for Limited Modifieds, Super Stocks, and F4s. Drivers will be chasing national, state, and track championships along with season long bonuses and cash prizes. The region’s youngest drivers in Jr. Late Models, Bandoleros, and Mini Cups will also have their opportunity to compete this weekend. The SPEARS SRL Southwest Tour has not visited the one-third mile asphalt oval since 2012. The preliminary entry list only features one former winner – Carson City, Nev. Bobby Hodges - from the seven prior appearances at the track. Among the entries are numerous drivers looking to defend their home track All American Speedway powered by Roseville Toyota from the touring series drivers. Roseville’s Eric Schmidt, a former SRL and track champion, leads the list in search of his first Roseville SRL win. Local drivers searching for their first career SRL series win include Granite Bay’s father-and-son duo of John and Cole Moore, Loomis’ Jack Wood, and Elk Grove’s Mike Hite. NASCAR XFINITY Series veteran Dylan Lupton of Elk Grove will be making his first Super Late Model start at the venue as well. Saturday’s races offer the first night of points paying competition for Late Models at the venue since 2013 as well. Many of the region’s most popular drivers are expected to be in competition. Limited Modifieds and Super Stocks will each stage 30 lap main events while the F4 main event is 20 laps in distance. Mini Cups vs. Bandoleros for the youth drivers of the speedway also race for 20 laps. Weekend activities begin Friday with practice sessions limited to the race teams in competition. On Saturday, pit gates will open at 10 a.m. with practices beginning at noon. Time trials for the NASCAR and local divisions begin at 3:00 p.m. Grandstand gates will swing open at 4 p.m. and will be followed by SPEARS SRL Southwest Tour time trials. Trophy dashes will follow with opening ceremonies and feature events at 6 p.m.
General Admission is $20 for Adults, $15 for Military/First Responders/Seniors 65+, $12 for Kids (6-12), and kids five and under are free! Tickets will be available for purchase on the track website starting Friday, April 5th. More information can be found on the track’s website www.AllAmericanSpeedway.com and by following the track on your favorite social media accounts. Additional details are available by calling the track info line at (916) 786-2025. All American Speedway is located at 800 All America City Blvd in Roseville.